I wish to know what fMRI data looks like after preprocessing. My understanding is that fMRI is MRI in time dimension that is we have repeated scans of brain volume. 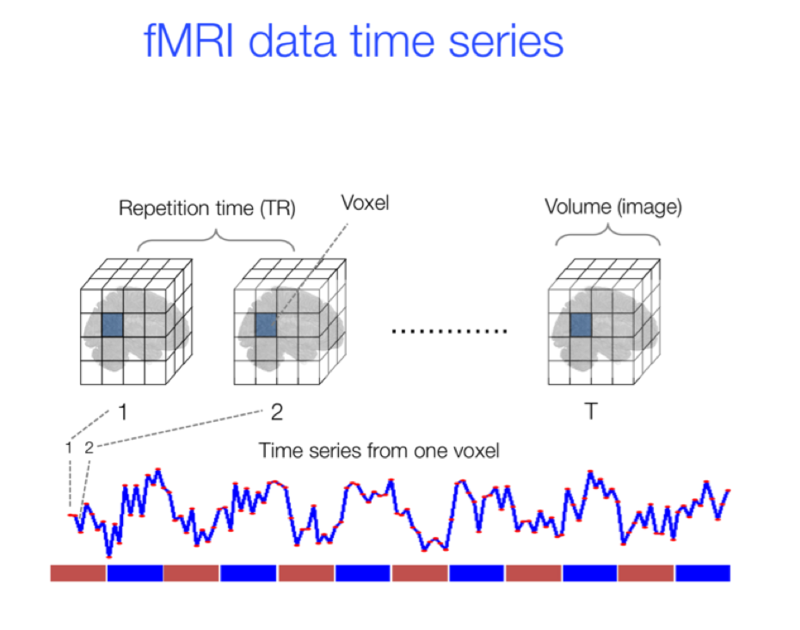 A voxel is a unit if measurement in fMRI because BOLD signal is measured on a typical voxel in different regions of the brain using gradient of the High frequency signal. For example if we have fMRI scans say of D ADHD patients, V voxels and T time points in a fMRI study then how the fMRI data after pre-processing would be arranged in a matrix form. If we assume that it is organized in D x V x T then we have a 3D scan of each brain on a time dimension. Since each 3D scan consists of voxels in the brain, and voxels are cubes that have 6 values around them, then where are those 6 values? If a voxel is a cube, does it have a single value, or 6 potentially different values on each face? I know voxels have coordinates like that in the MNI coordinate system. The MRI signal is a small electrical current induced in the receiver coil by the precession of magnetization during resonance, i.e., a manifestation of Faraday's Law of Induction, wherein a changing magnetic field induces a voltage in a nearby conductor. The BOLD response often used in fMRI measures the hemodynamic response, i.e., the relative levels of oxyhemoglobin and deoxyhemoglobin that can be detected on the basis of their differential magnetic susceptibility. As any digital signal, there are limits to the resolution of fMRI, and is dependent on a number of factors (Kashou, 2014), including the field of view (x- and y- directions) and the slice thickness (z-direction). Multiplying the x, y and z sizes results in the total voxel size (Fig. 1). each voxel has 1 value, namely its respective BOLD response signal value. Not the answer you're looking for? Browse other questions tagged methodology fmri data signal-processing or ask your own question.